This is my friend Lynn’s recipe and I thought I would give it a try, it was heaven! It’s similar to my chocolate cake recipe, except it has coffee and instead of water, and uses butter instead of oil. I also tried out a new frosting, after being inspired by my last month’s Cooks magazine. I used some of the tips from that recipe along with some tips from my good old Betty Crocker. After I had the cake frosted, I thoght why not make it even more decadent, so I got out a block of milk chocolate and grated it all over the top. Thanks for the recipe Lynn! In large bowl whisk together all dry ingredients. In separate bowl whisk together all remaining ingredients. Add wet ingredients to dry mixture and mix by hand until just combined. Pour batter into 3 9-inch buttered and floured cake pans. 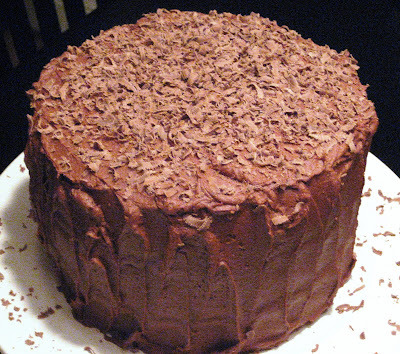 Bake in a pre-heated 350 degree oven for 30-35 minutes or until toothpick inserted into center of cake comes out clean. Heat chocolate chips and butter in a saucepan over low heat until melted, remove from heat and set aside to cool about 5 minutes. Stir in sour cream, add powdered sugar one cup at a time and beat until well incorporated. Add just enough powdered sugar until frosting reaches spreading consistency. 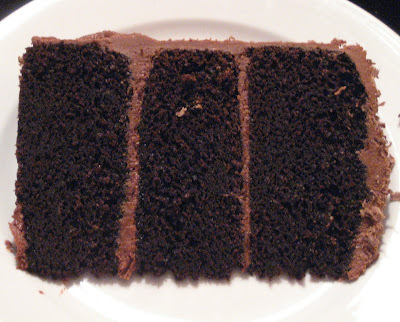 I wonder why this is called Black Out Cake? Maybe someone invented the recipe during a blackout??! Anyway, it looks absolutely divine.